1000 SERIES ISOLATORS CYLINDRICAL MOUNTS - 1/4-20 THREADS - H.A. King - Vibration Isolators, Noise Control, Shear Mounts, Shock Mounts and More! H.A. King’s Cylindrical Mounts with 1/4-20 threads provide an effective means of reducing noise and vibration. These rugged mounts feature a resilient elastomeric element bonded to steel fasteners. Our isolators are available in diameters ranging from 5/8″ to 1 1/4″ and thicknesses ranging from 1/4″ to 1 1/4″. Available size combinations are listed below. Cylindrical Mounts are an ideal choice for mounting applications such as pumps, motors and generators. 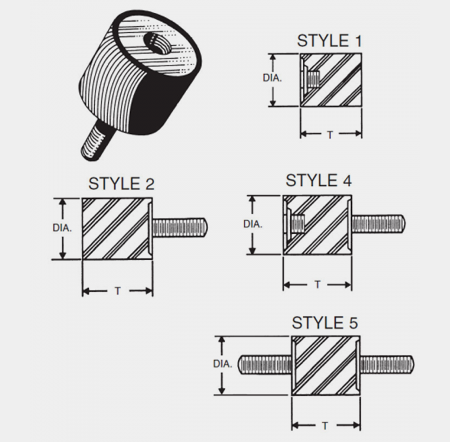 Please note – select sizes of these mounts are also available in metric (M6) threads.